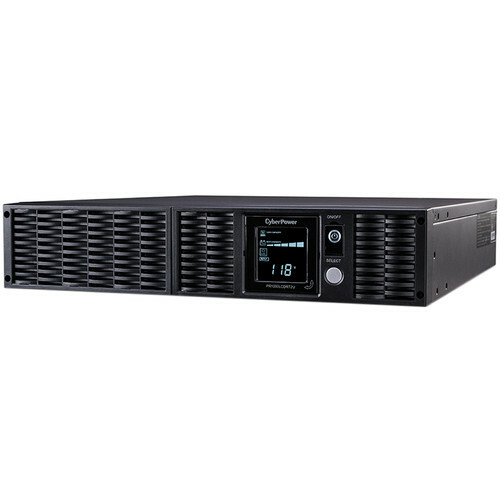 The CyberPower PR1000LCDRT2U Smart App Sinewave UPS (1000VA / 900W) features an LCD panel, sine wave output, and is active PFC-compatible for safeguarding mission-critical servers, telecom equipment and VoIP, and internetworking hardware that require seamless pure sine wave power. It incorporates a microprocessor-based digital control and includes PowerPanel Business edition software. The UPS system is ENERGY STAR qualified with GreenPower UPS Bypass circuitry to reduce energy consumption and heat build-up. Box Dimensions (LxWxH) 22.0 x 20.6 x 10.3"
PR1000LCDRT2U Smart App Sinewave UPS (1000VA / 900W) is rated 4.0 out of 5 by 1. Rated 4 out of 5 by Cross from Waiting for the Hurricane I like big upsupply, I cannot lie. It's too early in it's lifetime for a review, but for right now it looks like it will handle my full a/v rack (8 amplifiers) that also includes compute (servers, NAS, network, etc.). We'll see.